Building effective communication skills is essential and our training will help you optimize your message to distinctive target audiences and build effective interpersonal skills. This module focuses on how to foster a climate of communication and the different ways in which communication might flow within a business. This module describes the growing range of written business communication options, examines rules governing several types of written communication (eg, e-mail; blogs; memos; business letters, handwritten notes, reports, and proposals). It concludes with a general discussion of the effective handling of phone calls and voice mail in the business environment. This module discusses various types of business meetings, the purpose for meetings, and how meetings should be planned and conducted. This module describes how to create an effective business message. It discusses when written communication is the best choice and looks at how to plan, compose, and revise written communications. This module begins with a description of the advantages and disadvantages of presentations and when they should be the communication tool of choice. 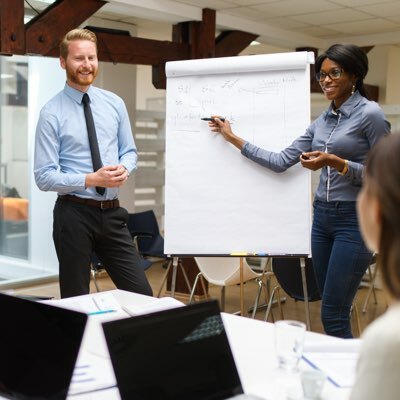 It then discusses the process of making a business presentation, including planning, organizing, selecting visual aids, and delivering the presentation. This module describes elements of good communication, including: synergy and the win/win approach, rapport: listening and understanding, being understood, timing and directness, emotional intelligence, and nonverbal communication. This module concludes with a discussion of handling criticism and conflict. This module focuses on the advantages of good communication and common communication problems in business. This module explores how the communication process works within organizations, and considers the behaviors and interferences that can cause problems.